Language and Thought: Interdisciplinary Themes. Edited byPeter Carruthers and Jill Boucher, 338pp (Cambridge University Press, 1998). What is the place of language in human cognition? Do we sometimes think in natural language? Or is language for purposes of interpersonal communication only? Although these questions have been much debated in the past, they have almost dropped from sight in recent decades amongst those interested in the cognitive sciences. Language and Thought is intended to persuade such people to think again. It brings together essays by a distinguished interdisciplinary team of philosophers and psychologists, who discuss various ways in which language may be implicated in human cognition. The editors have provided an introduction which lays out the basic terms and history of the debate, and a consolidated bibliography which will provide a valuable reference for all those interested in this area. The volume will be of great interest to all researchers and students interested in language and its place in cognition. (from the back cover). Peter Carruthers and Jill Boucher. Introduction: opening up options. Susan Goldin-Meadow and Ming-yu Zheng. Thought before language: the expression of motion events prior to the impact of a conventional language model. Jill Boucher. The prerequisites for language acquisition: evidence from cases of anomalous language development. Juan-Carlos Gomez. Some thoughts on the evolution of LADS, with special reference to TOM and SAM. Peter Carruthers. Thinking in language? : evolution and a modularist possibility. Rosemary Varley. Aphasic language, aphasic thought: an investigation of propositional thinking in an a-propositional aphasic. Andy Clark. Magic words: how language augments human computation. Dan Sperber and Deidre Wilson. The mapping between the mental and the public lexicon. Stephen Laurence. Convention-based semantics and the development of language. Martin Davies. 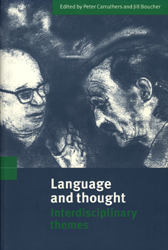 Language, thought, and the language of thought (Auntyís own argument revisited). Keith Frankish. Natural language and virtual belief. Josef Perner. The meta-intentional nature of executive functions and theory of mind. Daniel Dennett. Reflections on language and mind.